high-kicks, and loud yells mimicking the moves of Kung Fu movies stars like Bruce Lee, Jackie Chan, Steven Seagal or Michelle Yeoh. Jackie Chan, Steven Seagal or Michelle Yeoh. 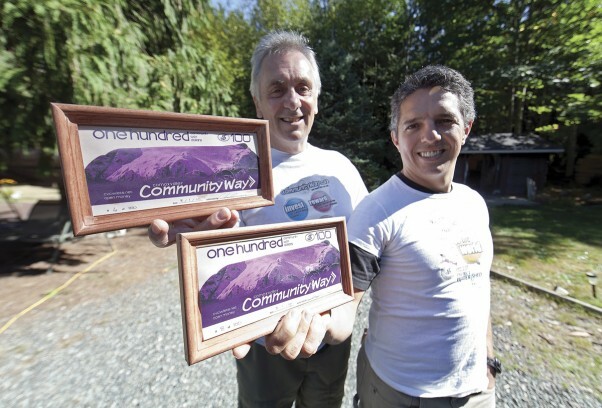 They may be from different parts of the world and have completely diverse business backgrounds, but a common interest in building an economically sustainable community has Comox Valley residents Michael Linton and Pieter Vorster collaborating on a unique local project. They call it ‘Community Way’ and it is just one of many systems of an ‘open money’ program. While Vorster is fairly new to the project, Linton has been developing community currencies for almost 30 years. He began his research in 1982, when a recession had rocked our country, interest rates shot sky-high, and people of the Comox Valley (and elsewhere) complained that there was ‘no money’ to be earned, spent or invested. Linton, an articulate and well-educated man who emigrated from the United Kingdom and holds an engineering degree and an MBA, among other professional designations, was one of few who were not discouraged. He began working on a system that he believed would generate and keep ‘money’ in the Comox Valley. This was about the same time the LETSystem, a model that has reportedly since been replicated more than 3,000 times around the world, was conceived. The ‘LETS’ name is based on the concept of LETS PLAY, which is an open invitation to all to come and go freely, play safe, and make everyone a winner. After considerable research and development of a LETS model, in 1999, Linton launched a pilot project based on similar principles in the Comox Valley. Rather than printed bills, it used ‘Smart Card’ technology to keep track of the currency transactions. The ingenious system caught the attention of social activists and the media nation-wide. Linton’s community currency project was profiled in Maclean’s Magazine and other national news media. As a business owner specializing in social media solutions and website development, Vorster is used to having to spell things out to people who don’t get it. He smiles sympathetically and clarifies in his gentle South African accent that this current protocol of open money systems is called Community Way dollars (cw$). It is loosely based on the old-fashioned barter system. Remember, the good old days when a doctor might get paid for a house call with a live chicken and a sack of potatoes? In today’s society, that would not likely be considered a fair trade. After all, not everyone wants a chicken and you can’t pay your bills with potatoes! Also, with the barter system, there are tax implications of not claiming revenue earned. And bartering can devalue products sold or services offered. Trading in cw$ brings these old-fashion ideals right back into fashion. Another analogy that may be more familiar to consumers, says Vorster, is to think of Community Way dollars in terms of Canadian Tire dollars or Airmiles®. These two examples are widely accepted and perfectly legal. You simply collect credits/points, then spend or redeem them according to parameters established by the participating businesses. One important distinction between the Community Way program and other points programs, however, is that the cw$ are valued in units equivalent in measure to the national currency. For example, cw$1 equals exactly CAD$1. The other important difference is that is not just one store honoring the money, but many. The existing Comox Valley Community Way program is administered by an open money development group, which operates like a limited liability partnership or LLP. It is not a non-profit association and does not hold charitable status. It is just an informal, not-for-profit community service organization. While Linton, Vorster, and others have put some cold, hard Canadian cash into the system in order to launch the program, most of their investment over the years has been in sweat equity and time. Community Way dollars are printed in denominations of cw$1, cw$5, cw$10, cw$20, and a series of commemorative cw$100 bills. Like traditional currency, they are difficult to duplicate. This money is managed and accounted by the development group and put into circulation when a business signs up for the program and elects to make a donation of cw$ to the local not-for-profit group of their choice. The business is also asked to pay an optional registration fee, in cw$ of course, to help cover operational costs of the program. Some transactions also take place online, as Community Way participants have the ability to access and manage their own cw$ account. It is important to note, says Linton, that businesses make their donation to charities in cw$, not Canadian currency. Their commitment of cw$ is recorded in a ledger, very much like bank transaction (only there is no interest charged on the balance owing). If, at some time in the future, the business decides to cancel their participation in the program, they are obligated to honor the money they have issued by directing cw$ they have accepted from customers to bring their balance owing back to zero. At present, close to 40 local charities are benefiting from cw$ donations. This includes a few schools and community groups such as the Comox Valley Hospice Society, the Boys and Girls Club, Lush Valley Food Action Society, Dawn to Dawn, Kitty Cat PALs, and others. Non-profits interested in being on the beneficiary list should contact Community Way for more information. The non-profit group receiving the cw$ donation may issue a tax receipt to the business and then spend the gifted cw$, no differently than cash, at any one of about 75 participating businesses in the Comox Valley. Current participating businesses include everything from food and lodging to health and wellness, business services, music lessons, sports, entertainment and more. Each business sets the parameters as to what percentage of a bill may be paid with cw$. Some businesses accept 100 per cent cw$. Others, such as restaurants, may accept only 50 per cent. A gas station may only take part at 10 per cent. For example, if a product or service costs $50 plus HST (for a total of $56), you may be able to pay $36 in Canadian currency (or on your credit/debit card) and the $20 balance with cw$. The business is still required to calculate the tax on the total amount of the sale and record the cw$ in their till as another form of payment. The non-profit may also ‘gift’ cw$ to staff or volunteers as a measure of appreciation, or sell them to supporters as a fundraiser, as a way to generate Canadian currency. For anyone with a soft spot for charities—but not a lot of time to volunteer or Canadian currency to give— this is an excellence way to market products and services while doing something good for your community. By enabling non-profits and any business participating in the program to pay a portion of your fee with cw$ you are, essentially, reducing their hard costs, without de-valuing your services. The end result will always be money in a customer‘s pocket that is ready to be spent with a community-based business, which then continues the cycle. It truly is a win-win-win situation. The main idea behind the community currency is that the money stays in the Comox Valley. Vorster can attest to the fact that with Community Way dollars, what goes around does indeed come around. “I once drew a little cartoon on a cw$ bill and, months later, that same cw$ came back to me,” he says with a laugh. Like most people, Vorster’s first reaction was, “What’s in it for me? Before they fully understand the program, charities invited to become part of the Community Way program also often echo the ‘What’s in it for me’ mantra. Some are just a bit apprehensive; others have turned down the opportunity to be involved. Considering that most non-profit groups are managed by a volunteer board of directors who are accountable to their membership and to the government, their concerns are understandable. Change is hard to accent, sometimes even harder to implement. Once they accept their first donation and the cw$ start circulating, participating charities soon realize the benefits and reap the rewards. The Comox Valley Community Way program can now be deemed a success and other communities in British Columbia are showing an interest in developing their own system of community currency. A replication of the program for Powell River is in its infancy; another in the Kootenay Region has been launched, and several communities in Vancouver are considering implementing the program, too. For information on the Comox Valley Community Way program visit www.communityway.ca or call Pieter Vorster at 250.792.2874. For information on open money systems in general, visit www.openmoney.org.